Commercial space tourism company Blue Origin, and its overlord Jeff Bezos, have been pretty quiet over the last few months. But last week, the Amazon founder made his first Instagram post, which appears to show the billionaire stranded on the roof of his own rocket facility in Florida. Because he is Fun. Haha. The video opens with a spectacular view of Blue Origin’s 750,000-square-foot orbital launch facility near Kennedy Space Center in Florida, which is currently under construction. Blue Origin told Gizmodo that the video is captured from a drone. The progress is pretty impressive, considering this is what the site looked like last December. The best part of the video—or whatever it is—is that you get to appreciate the grandeur of an up-and-coming spaceflight facility, one that’ll eventually house and launch Blue Origin’s heavy-lift orbital rocket, New Glenn. But things quickly take a turn for the worse. The camera zooms in on Bezos, who’s lounging in a chair on the roof of the facility with the nonchalantness of a dad enjoying a half-priced Mudslide at a TGI Friday’s. 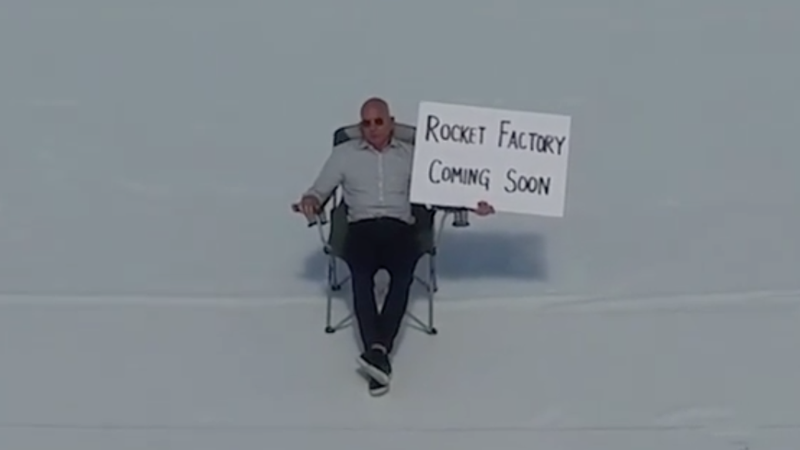 He’s silently, expressionlessly holding a sign that says “Rocket factory coming soon.” Classic Jeff. Haha. Blue Origin hasn’t disclosed when the facility will be completed, though according to Space.com, it’s expected to be finished this year. Could Bezos’ cringeworthy Instagram mean it’s coming sooner than expected? At the very least, it was an earnest attempt at a human emotion. Update 5:15pm: Blue Origin told Gizmodo via email that the Instagram post is actual video footage from a drone, not a rendering. We’ve included that detail in the post.